The flavors of August are myriad….Music is truly a universal language and the joy of reaching out through music is what gives satisfaction and contentment for any artist who pursues his or her mission with focus. Sudha is gifted to belong to that selfless group and her experiences across the varied section of audience demystifies any enigma that may be associated with music or the musicians….so free, so abundant, so ethereal and so satisfying. August’s sojourn began with a concert during the concluding day (5th August) of the Indraprastha Sangeet Samaroh’s three day festival (conducted by Sahitya Kala Parishad, the cultural wing of Govt. of National Capital Territory of Delhi. She sang to a large, knowledgeable audience, who were predominantly rasikas of Hindustani music, in the august presence of Ms. Sheila Dikshit, Chief Minister of Delhi, who sat through the entire concert and later conveyed her personal appreciation, with affection. For Sudha, Bengalooru is like hometown. The adoration from the audience towards her and her music always leaves her overwhelmed. 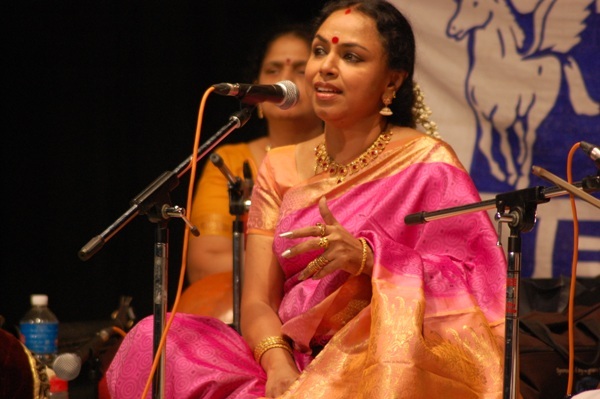 Perfectly at ease with Thygaraja, Purandaradasa and Bharathiyar, the audience understands, appreciates and follows all languages of music and is truly an artist’s delight.